Jewish forced Laborers in a water works camp (Wasserwirtschaftslager) in the Lublin District, IPN Lublin 500/44. Previous research has uncovered a considerable number of photographs from several forced labour camps throughout the Lublin District. 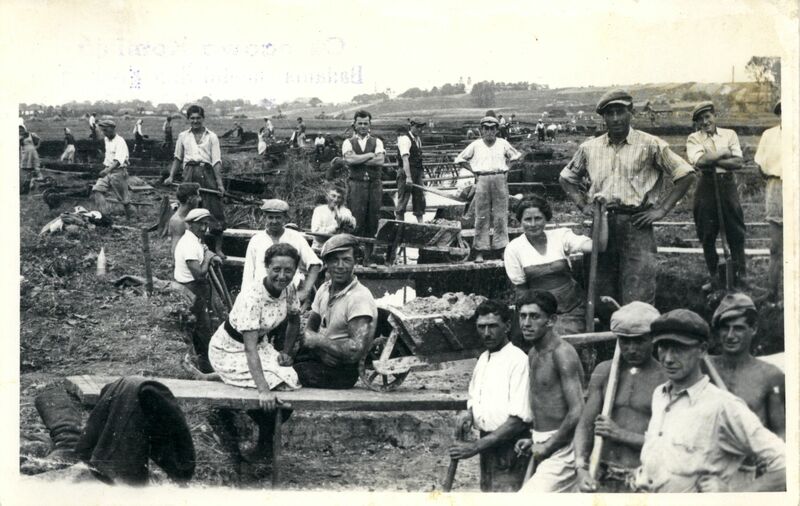 Usually the photographer is unknown, as is the fate of Jewish labourers depicted. This photograph is exceptional in that we know something about the author. Władyslaw Mączka, born 1906, was a Polish farmer and resident of Tyszowce, in the southern part of the Lublin District, south of the road connecting Zamość and Hrubieszów, and near to today’s Polish-Ukrainian border. According to his testimony – given to the Polish Public Prosecutor in Lublin in March 1968 – he was the owner of a secret photo studio and was living next to Zwangsarbeitslager (ZAL) Tyszowce. Mączka reported having been asked by Jewish labourers of the camp to take pictures of them digging to regulate the river Huczwa. In summer 1940, German authorities ordered the Jewish Council in Lublin to finance a forced labour camp in Tyszowce. The camp was located at a large burned-out mill opposite a school, with 500-600 inmates. The first workers were dislocated from the forced labour camp at Bełżec, and later from Warsaw, Lublin, Otwock, Kalisz and numerous other Polish cities. Starting in late 1941, they also came from occupied Czechoslovakia. As can be ascertained from the picture, Jewish workers had to labour without appropriate footwear in Tyszowce and in other work camps, spending an eight-to-ten hour day in the inlets of the Bug River. Two other important aspects in this image is that the workers were usually young, and, more importantly, were frequently female. The camp existed from August 1940 until spring 1942 when remaining inmates were deported to the extermination camp at Bełżec. The annotation of the document was made possible by Neatline (an Omeka plugin), some of the historical borders used here were adapted from the Spatial History Project. Accordingly, the memorandum of the Warsaw Jewish Council comes to the conclusion that the forced labour camps of the German Water Works Management were synonymous with penal camps. Due to the camps’ vicinity to the later extermination camps, most of the workers who survived labour at the water works at the beginning of 1942 were later murdered either in Bełżec or in Sobibór. Primary sources on the fate of the Jewish forced labourers from Warsaw in non-industrial forced labour camps (like Tyszowce) have recently been made accessible as volume 24 of the Ringelblum Archives, with original documents attached as scans on a CD-ROM.